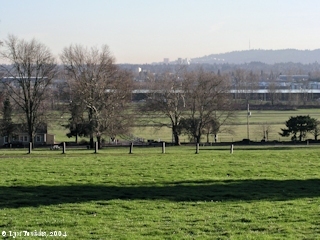 Click image to enlarge Columbia River and "Jolie Prairie", from Officers Row, Vancouver National Historic Reserve. Green grass in the foreground is the Vancouver Barracks Parade Ground. Image taken August 26, 2006. "Jolie Prairie" is the name of the flood plain on the north side of the Columbia River at River Mile (RM) 107. In 1829 it became home to the second Fort Vancouver. 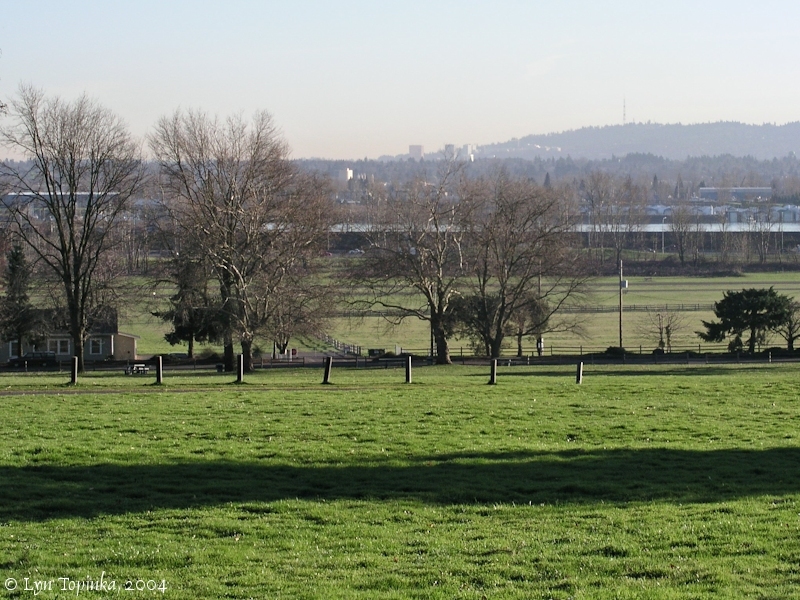 Today Jolie Prairie is home to the Vancouver National Historic Reserve, including Fort Vancouver, Pearson Airpark, Vancouver Barracks, Officer's Row, and the condominium/restaurant complex of Columbia Shores. "Jolie Prairie" is French for "beautiful prairie". The prairie was one of many "Plains and Prairies" of the Hudson's Bay Company and was occasionally referred to as "Belle Vue Point". It should not be confused with Belle Vue Point located today on Sauvie Island. 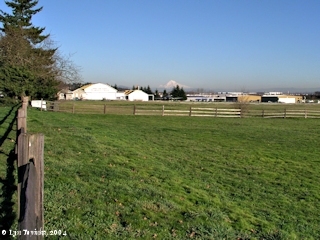 Click image to enlarge "Jolie Prairie", Vancouver, Washington. Image taken March 8, 2004. Click image to enlarge Pearson Field, "Jolie Prairie", Vancouver, Washington. View of the Jack Murdock Aviation Center (left) and the Pearson Airpark (right). Mount Hood is in the background. Image taken March 8, 2004. Lewis and Clark first passed through this area on November 4, 1805. Ponds, long since gone, once existed in the area. On their return upstream on March 30, 1806, Lewis and Clark set up camp in this prairie. 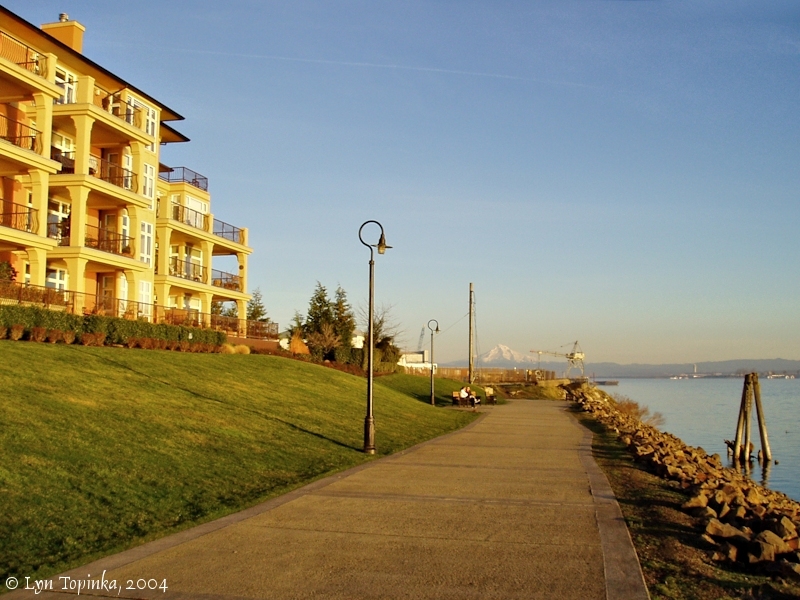 Columbia Shores is a condominium/restaurant/office complex located on the lowlands of the Columbia River once known as "Jolie Prairie". Lewis and Clark spent the night of March 30, 1906, on this "beautifull prarie above a large pond". Click image to enlarge March 30, 1806 campsite, looking upstream. "Columbia Shores", Washington, with Mount Hood, Oregon. Image taken January 20, 2004. "... In 1824, George Simpson, North American governor of the Hudson's Bay Company, ordered the abandonment of Ft. George and the search for a new post on the north side of the Columbia River, Criteria for locating the new post included the desire to strengthen British claims to the land north of the Columbia River, and for the HBC to render themselves '...independent of foreign aid in regard to Subsistence.' The search for suitable terrain -- land lacking steep banks or low, flood prone areas -- ended at Jolie Prairie, about one hundred miles from the mouth of the Columbia River. ..."
In Simpson's early correspondence regarding this site he referred to this prairie as "Belle Vue Point", apparently in the belief it was the same point of land named in 1792 by Lieutenant Broughton of the Captain George Vancouver Expedition. Today historian's believe Broughton's "Belle Vue Point" was located downstream either on the eastern tip of Sauvie Island, or it was the point today called Kelley Point. "... The site of Fort Vancouver, called Jolie Prairie, was located near a Chinook Indian village named Ske-chew-twa that was located on the site of the W.W.I. Kaiser Shipyards. Jolie Prairie was later named Fort Plain by the Hudson's Bay Company, and became the core of Fort Vancouver. The first stockade, which operated between 1825 and 1828, was located about three quarters of a mile from the river on the edge of a terrace. This location, sixty feet above the low-lying river plain, offered protection from floods and served as a strategic defensive position from the undetermined threat of native Chinook Indians. The naturally occurring plain provided open land for agriculture, and grass for livestock pasture. The coniferous forests surrounding the plains provided a ready supply of timber for fuel and building materials. The streams on Mill Plain, six miles east of Fort Plain, provided a power source for both a grist mill and a saw mill. ..."
"... At its height, development at Fort Vancouver was located in three large prairies called Fort Plain, Lower Plain and Mill Plain, and five smaller prairies to the northeast called the Back Plains (First Plain, Second Plain, Third Plain, Fourth Plain, Fifth Plain and Camas Plain). ..."
Lewis and Clark's camp of March 30, 1806, near today's Vancouver, Washington, was in a beautiful prairie lined with groves of Oregon White Oak. 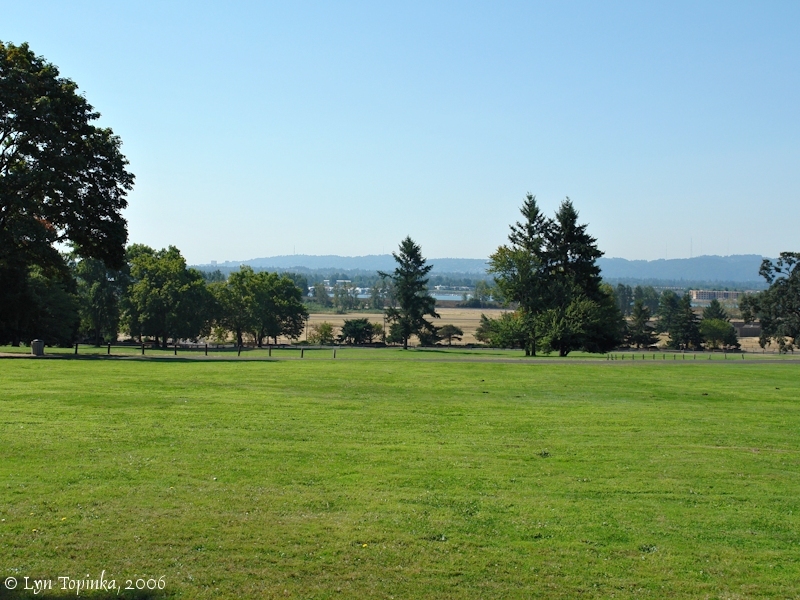 A part of this "beautiful prairie" is today's Parade Grounds for the Vancouver Barracks. Oregon White Oak still exists on the Parade Grounds, including two large trees which may date from the 1850s.